Today is Martin Luther King, Jr. Day in the United States. During the recent holiday season, we stopped in Memphis on our way to New Orleans. We visited some great spots - B.B. King’s Blues Club, Sun Studio, and the National Civil Rights Museum. The museum is housed within the Lorraine Motel, where Dr. King was assassinated. The exhibits inside the museum use technology and innovative presentations to tell a powerful story of the struggle for civil rights in America. 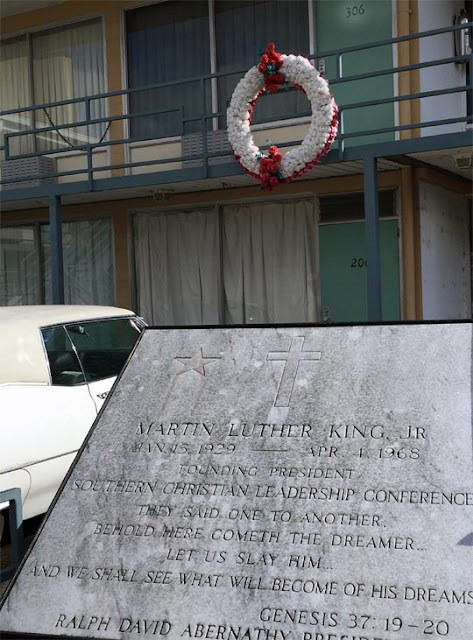 The photo below shows the balcony outside Dr. King’s room (#306) at the motel/museum, and the plaque that honors him.